On August 19, 2018, I got my 500,000th view on YouTube. There are people who were unlucky enough to get a zillion views for falling backward into a wedding cake, and have to wear that for the rest of their lives. The universe was capricious enough to give me the opposite experience -- a video that has made people incredibly happy all around the world. It could have happened to anybody, and I'm eternally grateful that, on that particular day, it happened to me. Today, "Whole Lotta Love" has more than 300,000 views -- one of the most watched videos by an "unknown" mountain dulcimer player. The other 200,000 views, though, are divided among nearly 50 other videos, most of which are aimed at showing the world what a little 3-string dulcimer can do. See some examples on my Videos page here. Rock on, world! And thank you! Sam Edelston is an entertainer with many facets. 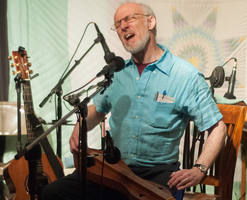 In recent years, he has been pushing the creative boundaries of the mountain dulcimer. He also performs on guitar, banjo, and occasionally hammered dulcimer, and sings. He does songs that span the rock & roll era and decades (or occasionally centuries) before that, plus folk, original songs, funny songs, shout-alongs, and more. 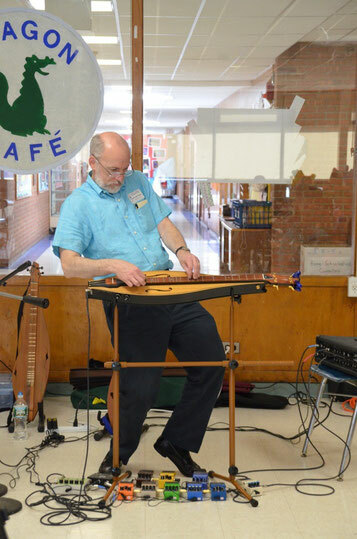 Sam is on a mission: "I believe that dulcimers are among the world's coolest musical instruments. I want the general public to know dulcimers the way it knows guitars and pianos." In November, 2018, Sam's video of the Led Zeppelin classic, Whole Lotta Love, on electric dulcimer, got its 300,000th view. If you exclude renowned artists like Joni Mitchell, Cyndi Lauper, and the Rolling Stones, only about a half dozen other mountain dulcimer videos have more views. Sam was featured in the Sunday, December 25, 2016 edition of the Connecticut Post and its four sister newspapers. "Displaying a frightening amount of rock mojo for a guy who seems fairly quiet and unassuming, Edelston used his amplified three-string mountain dulcimer to roar his way through ‘Whole Lotta Love’ without so much as breaking a sweat. After watching this, we’re ready to jump in a van and follow Edelston around on tour."